1. Shoprite stocks Kit Yamoyo in stores nationwide in Zambia. In Nov-15 Shoprite agreed to carry Kit Yamoyo in all its stores nationwide. Who would have thought that just 3 years from starting the ColaLife Trial in Zambia we would have a locally produced ORS and Zinc product developed, approved and on sale nationwide in Zambia’s biggest supermarket chain? This could change everything. The challenge with children’s diarrhoea is that parents and carers can’t easily get the treatment. We know how to treat diarrhoea and the treatment is simple, safe and cheap but far too few have access to it. Well, in Zambia, they will now. Equally significant is that Shoprite provides a direct link between Kit Yamoyo being scanned at the till and automatic reordering from the manufacturer, Pharmanova. This is another example of the benefit of working through existing organisations and systems. ColaLife hasn’t had to create new systems and take on the support of them in the future: we’re just making existing systems work to improve access to diarrhoea treatment. 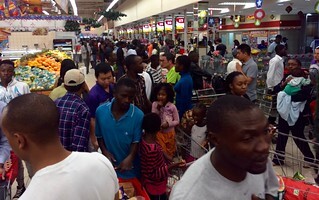 Supermarkets also act as wholesalers to market traders and small shops – another link in the value chain. 2. Our biggest order: public sector health centres to stock the new ORS/Zinc co-pack. In Mar-15 our pharmaceutical partner, Pharmanova, received an order to supply 452,000 ORS/Zinc co-packs, closely based on the Kit Yamoyo design, to the Ministry of Health (GRZ). 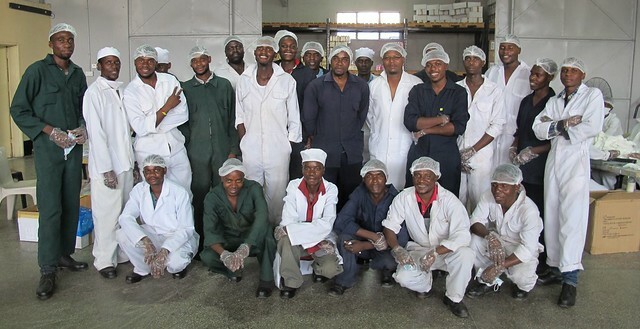 This has led to 24 new jobs at Pharmanova – a new team, engaged full-time on ORS/Zinc co-pack assembly, as well as assembling Kit Yamoyo for the private sector. Our original design decision, to carry product branding on an inter-changeable leaflet, has paid off again. It has allowed an ‘alternative product’ to be produced very quickly by simply changing the leaflet. 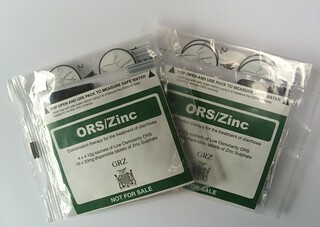 The ORS and Zinc in the co-pack is the same as that contained in the Kit Yamoyo version. based on the ministry’s preference, the co-pack does not contain soap. This one-off order was funded through the KYTS-ACE project, but we hope the new design will prove its worth and this will establish a precedent for the Ministry of Health to order in future. 3. ColaLife wins GSK and Save the Children Healthcare Innovation Award. In Jan-15, the ColaLife partnership won the Healthcare Innovation Award, an initiative from GSK and Save the Children. 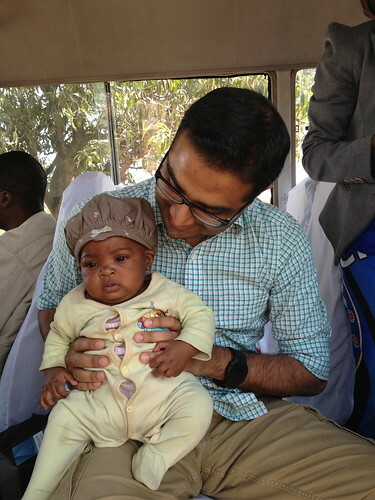 This is probably the most significant award in the world for innovation in child health. It came with prize of £248,000 – which has made many other things possible for us. Without this prize money we wouldn’t have been able to apply for funds from DfID – UK Aid Direct – to develop the market for Kit Yamoyo in Lusaka (KYTS-LUSAKA). The bid needed 25% match funding in cash. This vital project began in October 2015. See item 5. 4. 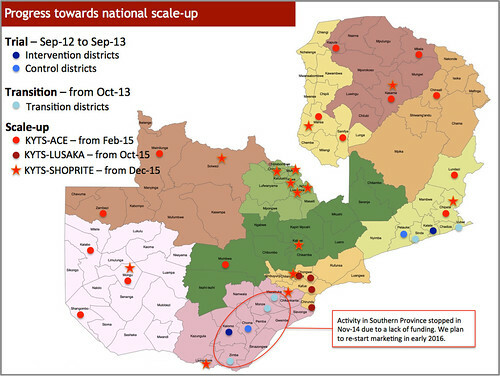 Market development in remote districts: the KYTS-ACE project. Before Jane and I left Zambia at the end of Jun-14, we helped our frontline partner, Keepers Zambia Foundation (KZF), bid into the local Scaling Up Nutrition (SUN) Programme. The project was designed to supply Kit Yamoyo anti-diarrhoea kits – and a public sector variant – into 14 of the most remote and poorest districts in Zambia, where malnutrition is a particular problem. This project began in February 2015, and is helping us reach some of the most sparsely populated areas of Zambia. KYTS is shorthand for ‘Kit Yamoyo Transition to Scale’ and reflects our ambition to scale-up distribution across Zambia. Poor remote areas are not be the best place to launch a new private sector health commodity, but the project helps fulfil our mission to reach all populations in need. 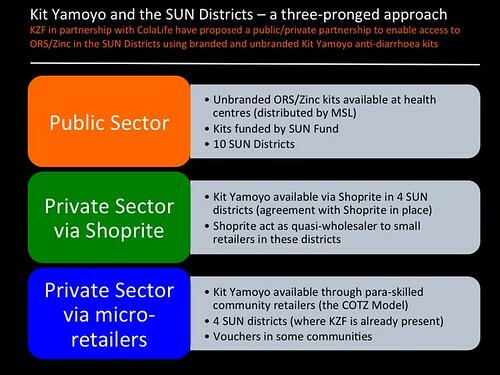 It has also triggered two key developments: 1) the production of a version of the kit for the public sector (see item 2 above) and the availability of Kit Yamoyo through Shoprite (see item 1 above). 5. Our best shot at sustainability for Kit Yamoyo in Zambia: the KYTS-LUSAKA project begins. In Apr-15, we heard from DfID (the UK’s Department of International Development) that ColaLife’s bid had a provisional award, under UK Aid Direct, to begin market development work in the densely populated province of Lusaka. The due diligence process was rigorous and took 6 months. 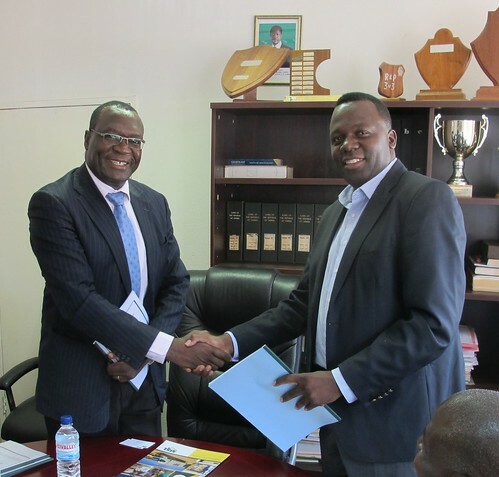 In Oct-15, the much anticipated KYTS-LUSAKA project started. As DfID has rigorous rules on measuring impact, we had to begin with a ‘baseline survey’. This gives us a ‘yard-stick’ to measure success. Data collection from a sample of 1,500 households was completed in early Nov-15, and is still being analysed. In December, our local partner, KZF, ran interviews for the project manager post. Chibale, our new project manager,starts work on 11-Jan-16 and we are very much looking forward to working with her. We’ve been trying for nearly 2 years to raise funding to work in a significant private sector market and track the best ways to establish Kit Yamoyo sustainably for the future. We have 30 months to do this: educating health workers and communities about the benefits of the new product, training retailers in small community shops, and also working to persuade drug shops, pharmacies and supermarkets to sell the product. 6. The Cola Road film made available for download. Claire Ward – the maker of The Cola Road – an award-winning documentary covering how ColaLife started in Zambia – has made her film available for free download. You can download the film here and this page also describes how we can support public screenings. We’ve moved on since the film was made, but it gives a beautiful picture of Zambia and the early challenges we faced. 7. Telling the world… spreading the word. ColaLife’s strategy for impact is to give away everything we have learnt – from designs to data and from challenges to success stories. We continually seek opportunities to disseminate our work. The most high-level presentations this year were at the Janssen/Johnson & Johnson headquarters in Beerse, Belgium and at the Royal Society of Medicine’s Innovation Summit. 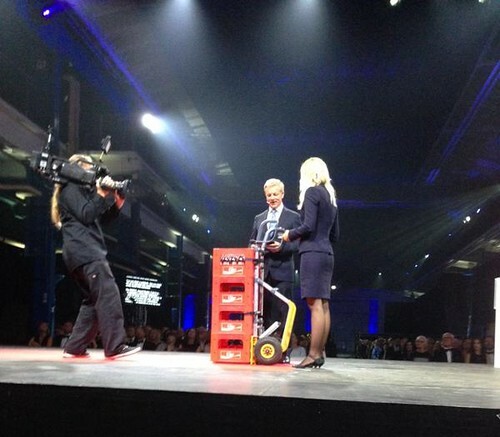 A video of the RSM presentation can be viewed here. 8. Memorandum of Understanding signed between local partners. 2. An agreement to carry advertisements for the commercial version of the kit – Kit Yamoyo – on MSL vehicles, at no cost, for at least a year. 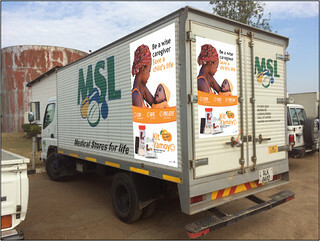 Since MSL’s vehicles travel all over Zambia, this is a key win for advertising Kit Yamoyo. 9. More awards and accolades! 1. The Kit Yamoyo Flexi-pack won Resource Efficient Pack of the Year at the UK Packaging Awards. This award was entered by our packaging partner Amcor Flexibles. 2. We were a finalist, with honourable mention, at the Index:Awards 2015 (see image). 3. CEO and co-founder of ColaLife, Simon Berry, was elected to the Ashoka Fellowship after a thorough due diligence process that took more than one year. This brings the number of Ashoka fellows to 34 in the UK. There are more than 3,000 fellows worldwide. 10. ColaLife’s principal investigator becomes Dr Rohit Ramchandani (DrPH), with his thesis based on the ColaLife trial. We congratulate Rohit on this achievement. He has worked very hard on this and given us three papers to submit to peer-reviewed journals: an important dissemination channel for us. The drafts of these papers are now available in our open access area. Rohit’s attention to detail in the survey design and analysis, his care in training survey enumerators and their supervision, in partnership with our survey contractor, RuralNet Associates, has given us the rigour we needed to be taken seriously in the Public health arena. Finally, as we say every year . . . a big thank you to everyone who has supported ColaLife throughout 2015. We are making great progress. We couldn’t do it without our supporters. You are the foundation of everything!